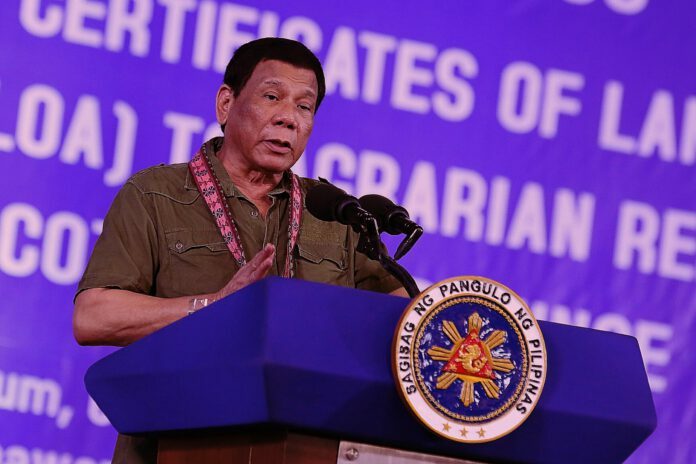 DUTERTE SAYS CHRISTIAN BELIEF IN 'TRINITY' IS SILLY in a speech at the Provincial Gymnasium Capitol Compound in Kidapawan City, Cotabato on December 29. President Rodrigo Duterte will never stop in attacking the Church and its faith as the Church leaders have no concrete and strong response to Duterte’s rants. “Magdasal ka na sa isang Diyos, magdasal ka pa dito sa santong yawa. Isa lang ang Diyos. (You’re already praying at one God, then you’re going to pray at these cursed saints. There’s only one God.) There’s only one God, period. You cannot divide God into 3, that’s silly,” said Duterte. ‘Yong Diyos mo, pinako sa krus. Tangina. Nakakawala ng bilib. Ako ang Diyos, tapos ipako mo ako? Putangina. Sabihin ko, ‘Lightning, ubusin mo ito. Sunugin mo lahat ng mga erehes,’” continued Duterte. Apart from calling God ‘stupid’, joking ‘bishops should be killed’ for supposedly doing nothing but criticizing his administration, the harsher attacks came in the form of a string of priests killed under his barely three-year old administration. Duterte knows that leaders of the Philippine Churches, though they have issued statements against his rants, abuses and attacks, the Church leaders, be the Roman Catholics or the Protestants and Evangelicals or Aglipayans, have not come together to have a united stand against him. Duterte will continue to attack one or two of the Churches, as long as some Churches will continue to support his presidency, because some are afraid of being drawn by progressive and nationalist Churches to swing to the Left, which will help the Left to gain more strength in leading the people’s struggle towards the ouster of Duterte. As long as this reality prevails, Duterte is gaining ground in attacking the Churches. As long as some church leaders are too cautious in joining alliances or a united front against the Duterte regime, Duterte will never stop his rants against the Church. At present, in the next year or in the years to come, the Philippine Churches must face the Duterte regime not only on his blasphemous attacks but on the real social issues. The option for the Philippine Churches at present is to put aside their differences, whether doctrinal, practices and way of professing their faith, and forge a united action. The leaders of all Churches must be challenged to address the pressing problems of the Philippine society and take into their hands the stand and call of Jaime Cardinal Sin during the dictator Marcos’ time. The Church leaders will not have to do it from scratch. They have already started a uniting walk during SONA in July 2018, commemoration of martial Law on September 21, 2018 and Human Rights Day on December 10. What can the Churches do in 2019 is to sustain and strengthen their strength in taking side with the people who are longing for justice and lasting peace. They should not wait for the May elections. Based on Philippines’ experiences, elections in the Philippines are always marred with fraud and violence. The early months of 2019 are good to start for the Philippine Churches to pay more, work more and act more than they had done.